I’m back today with post number 5 of my makeup sponge reviewing series and I always get so excited to try out new makeup sponges. 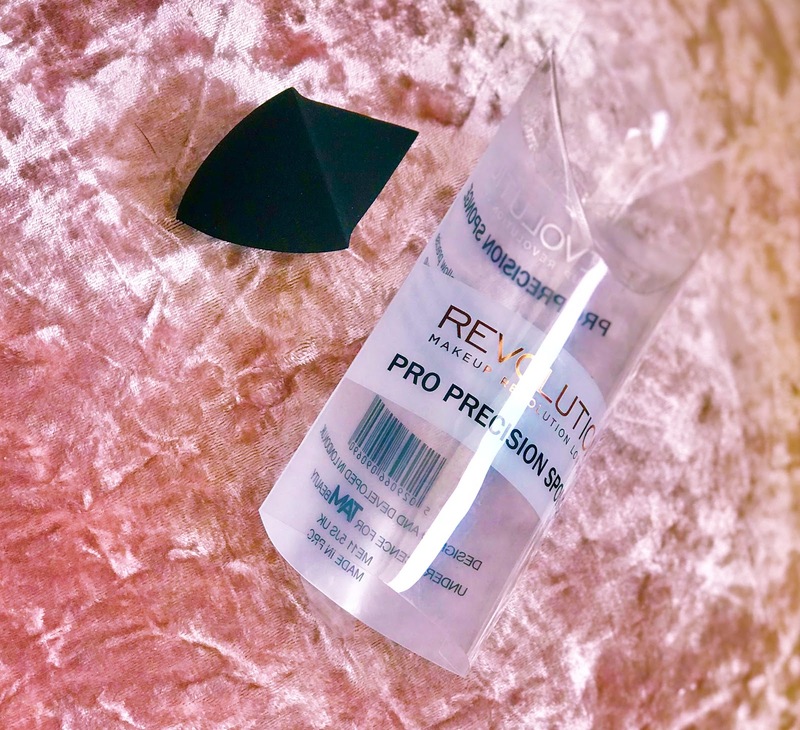 I came across this Revolution Precision Sponge when I was looking in the Revolution beauty website and I decided to try it out and then let you all know my thoughts ... especially as it was (and still is) in the sale for £1.50 from £5. If you would like to check out my previous posts in the series then you can click here. Usually it takes me at least a few uses to determine whether I actually do like a makeup sponge or not, but with this one it was more obvious in the first use whether I did or not ... obviously I'm going to save that info until the end or that would be a very short review wouldn't it? haha. Let's start off with talking about the shape, because I think the shape of a makeup sponge really helps with different areas of the shape and can really make or break the sponge and how it applies makeup. One side of this sponge is very similar to the original Beauty Blender, however the other side is much thinner and goes into a point. This can be seen as a good thing because it's not only the perfect size to get around the eyes, but it's also really good for getting a sharp edge when baking under contour. I always like my sponges to be more pointed at the top to make it easy to blend hard to reach and smaller areas, but I think a sponge does need either a flat edge or a more rounded edge to make it easier to blend out the rest of the base makeup. I did find it quite difficult to blend the rest of the face out mainly because I felt that the tips of the sponge moved the product rather than bouncing it in and this let to a very streaky application ... no matter how much I blended. 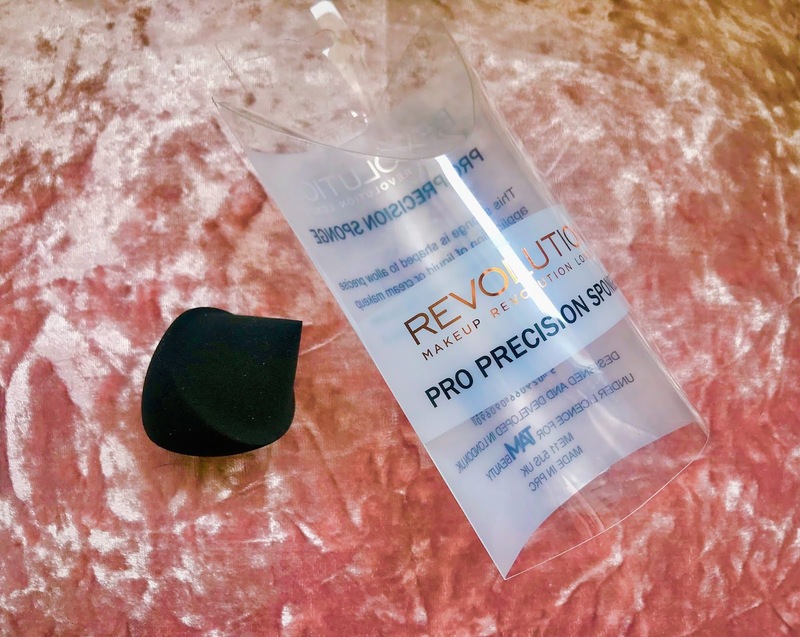 I had such high hopes for this sponge in the beginning, one because it's from easily my favourite makeup brand Revolution and that when I damped it, it did grow which usually means that it's going to be a bit more squishy and this gives it more of a bounce when blending. Well that seemed to be the case with all the makeup sponges that I have tried before. However, although the sponge did grow in size and felt a little bit softer, it did still have a stiffness to it and that lead to the products becoming really patchy and streaky on my skin. I think if it did have more of a rounded edge on the bottom that it could have helped a bit with the blending process. Overall, I'm not as pleased with this sponge as I have been in previous posts in this series or as much as I had hoped to be, however if you do like more of a stiff sponge, instead of a bouncy and squidgy ones, then this could be right up your street. A bonus for me is the more pointed tip as this did help with blending around the eyes and the nose. This sponge is definitely on the cheaper side compared to many others on the market, at just £5. It's currently in the sale though so I don't if thats because they're discontinuing it or maybe they might be bringing a new one out, you never know! Thankyou so much for taking the time to read this post and I hope you're enjoying the come back of this series. If there is a particular sponge that you would like me to try out and let you know my thoughts on, then please let me know in the description below. Easter Makeup Look! || Collab w/ AlixKate! Birchbox Unboxing | April 2019.